A tireless biography of the house first dubbed a gift to Queen Charlotte in 1763 and its transformations during nine generations of British monarchy. The politics of choosing an architect and designer are proportionate to appointing a successor to the British crown, according to Healey’s enormously detailed account of Buckingham Palace and the goings-on within, which will satisfry the most voracious Anglophile. Two hundred years of palatial minutiae are revealed through the lens of royal choices in aesthetics. Healey writes affectionately of the sovrreigns’ inspirations and idiosyncrasies, and although more is said of the royals and how they ruled than of the palace and how it stood, Healey valiantly chronicles each architectural reconstruction and takes every opportunity to link the dwellers to their home. 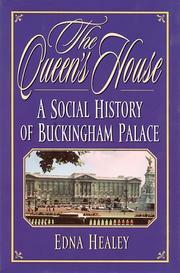 “When King George came to the throne he inherited two immediate problems: the front of the Palace, which needed urgent attention, and the stormy passage of the Liberal government’s Parliament Bill, aimed at curbing the power of the Lords.” Indeed, it would seem every coronation led to an equal number of architectural and political concerns. Healey’s moderate doses of imagination lend poignancy to profiles, like his depiction of King George III’s patience with sculptor Joseph Nolleken’s pinching “his nose while measuring with his calipers” and Queen Victoria’s wish to be in spirit with her deceased, beloved Prince Albert “at breakfast under the trees at Frogmore” the morning of her Golden Jubilee. By the time the palace is bombed in WWII, Healey has made it sufficiently heroic, as proven by King George VI’s and Queen Elizabeth I’s determination to remain in their home, despite the invasion it suffers. Nine air attacks on the edifice takes on heartbreaking grandeur, thanks to Healey’s dramatic account of its well-being. A clever inclusion of architecture in the essence of English royal history.